Not all ABBA releases are as inane as ABBA Gold....There are some ABBA related releases out there in the magical land of ABBAdom that would surprise and amaze you...On some of these albums we find Benny recording birds , Agnetha recording in German, Bjorn wears a wig and Frida singing in French,. 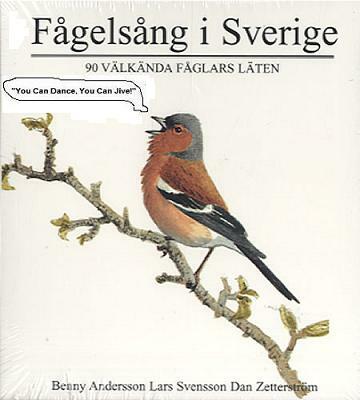 Fagelsang i Sverige- Available on Swedish Cd 1990 Swedish Cd. on the CD in between the birdsongs.There were two editions of this recording. The deluxe version includes a detailed booklet with drawings of the birds and the cheap version that has just the CD and a two page booklet. Released by Benny's label , MONO. Our boyz our on the cover decked out in 1700's garb. Björn has a mustache and is holding a wooden flute. Hansi is sharing a cocktail with Johan. 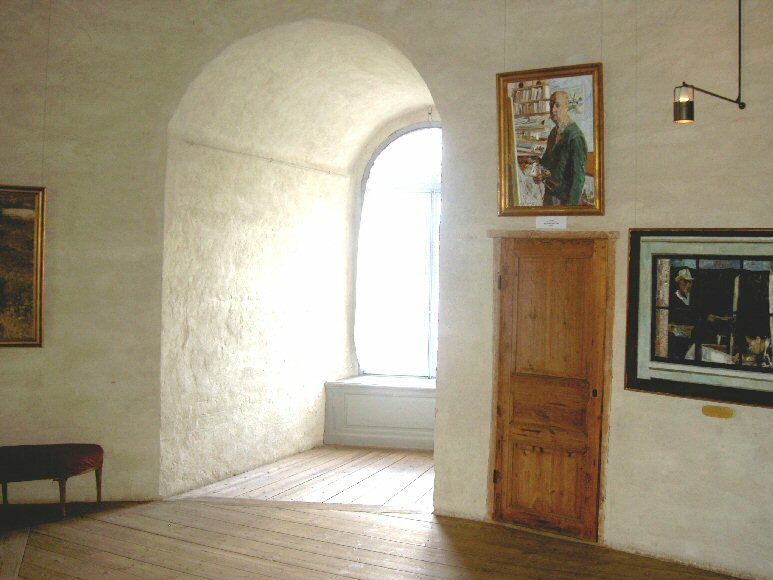 are paying homage to Swedish poet/musician Carl Michael Bellmann (1740-1795). The album's title means-" Bellmann our way". Bellmann's classic work was the Fredman's Epistlar published in 1790 .It's 82 songs tell the story of a middle class hard drinking clockmaker in a style that originally parodies the Pauline epistles. All of the songs here are adaptions of Bellmann songs .The boyz had to shorten many of the texts. project came. Obscure Hootz albums are not the kind of thing you hear about in ABBA interviews. This comes dangerously close to being a concept album... . Though, the group during it's career often focused on the repretoires of various Swedes. a less pop sounding album but the boys strident harmony singing sounds the same as it always has. Interestingly , there are some short orchestral bits thrown in here and there that were arranged by S.O. Walldorf. Walldorf would also do string arrangements for Agnetha's solo albums and ABBA themselves. This album was recorded at Metronome Studios in Stockholm and co-engineered by Michael Tretow. This is the earliest of the the Hootz studio albums to be available on Cd. This is the only Hootz studio album from the 1960's available on Cd. It was released on CD in 1992. German record markert particularly in 1968-1970.
to Bob Dylan- but you knew that). Agnetha on the International markert. Aggie released 8 singles for the German markert. All of which were actually recorded in German. She was not successful and gave up recording in German in 1972,by which time ABBA was about to break into the German markert. No album was released at the time, but in 1994 this compilation of the German tracks was put together by ROYAL RECORDS of the German tracks,. The title track is a German version of the Joan Baez song-"Here's To You'. Benny Andersson first saw Ainbusk ,a Swedish the singing/ theatrical quartet in the late 1980's. By 1992 Benny would produce this CD and cowrite three of the songs with Marie Nilson. Ainbusk's resident comedian and pianist. (Björn had no involvement!). The three songs Benny cowrote are "Drommarnas Golv", "Alska Mej " and "Jag mötte Lassie". "Lassie" was a Swedish hit. And yes, "Lassie is a song about a dog! Josefin shows off her vocal chops on "Lover Man", and "Alska Mej". The other three members names are Birgitta Jakobsson, Marie Nilsson and Annelie Roswall. of the ladies dressed up in strange costumes. This album was drawn primarily from one of Ainbusk's highly theatrical Swedish stage shows-"Ainbusk jubileumsshow". (Ainbusk's jubilee show). Apparently, some of the songs date from a couple years before. "Lassie' was released as a very successful single in October 1990, and "Alska Mej" was released as a single in April 1991. These songs were released on singles originally in different versions than the ones found here. of sideman to the incredibly silly -Michael B. Tretow. This is a funny album. The albums' title implies that this is a disco album but it's not-it's an album of humourous novelty/ songs inspired by singers like the Coasters. Agnetha, Björn , Benny and the Abba band play on this album and Agnetha, Frida and Karin Glenmark sing backing vocals, . 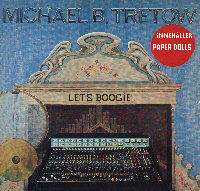 Of the tracks -Paper Dolls sounds the most like actual normal song...."Robot Man' has some cool backing vocals by Frida, Karin Glenmark and Marita Horn.. "Moonbeams" actually features Agnetha on piano..
doesn't have a great singing voice, and sometimes his great backing vocalists are not fully utilized. This would have been a more listenable album if Micke had Agnetha & Frida, hell, even Björn sing lead on a few of the songs, but the backing vocal are still quite interesting and Micke leads are usually funny... Until it's recent and much belated release on Cd , this album had been one of the rarer and most interesting ABBA collectibles.. This was originally released on Lp in 1976 in Scandinavia and Britain. It appears that the CD maybe out of print already. 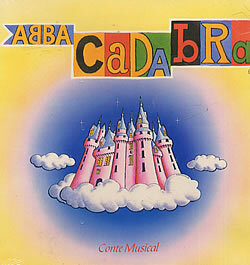 Various Artists-(concept album)-ABBACADABRA- 1983 French Lp and two later English singles. Reissued on a french CD in 1994 ,but again out of print. The idea here was to borrow the melodies from ABBA songs and write new lyrics so as be able to tell a story and also so as to be able to do it in French. (this was a French/Belgian coproduction). Apparently, B&B never saw the play-which seems bizarre. considering how times Bjorn has sat through MAMMA MIA. Supposedly the French version of this was reissued on CD in 1994.